An enlightening and delicious road adventure/cookbook from the young woman the New York Times dubbed "the Johnny Appleseed of Pickling." Three years ago, food activist Tara Whitsitt had a dream: to take to the road in a converted school bus and spread the gospel of kombucha, kimchi, and kefir nationwide. She would bring her microbe-dense delicacies, her expertise, and her generosity to food communities across the country. Her motto: Tasty food belongs to everyone. In a 1986 International Harvester bus-turned-fermentation-lab, Tara took off from Eugene, Oregon, teaching her skills to curious attendees, hosting potlucks, and sampling the seasonal produce of each stop on her tour. The project accrued a following, and she gave it a name: Fermentation on Wheels. 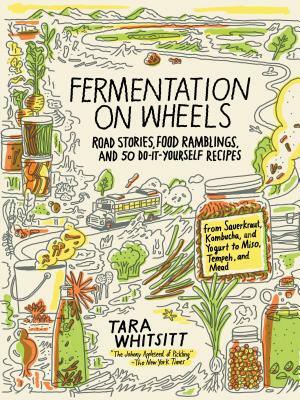 Through her winning stories, illustrations, photographs, and fifty recipes, Fermentation on Wheels tracks the two-year. twenty-thousand mile journey that made Tara into a known apostle of outrageously delicious, creative, healthy, and sustainable fermented flavors--from sourdough to sauerkraut to wild berry wines. A practical and delectable cookbook, Fermentation on Wheels is also an inspiring celebration of how food traditions (and starter cultures) can bring people together, pollinate their minds, and change their lives for the better. Tara Whitsitt is a nomadic artist and educator whose passion for growing food and teaching fermentation inspired the grassroots educational project Fermentation on Wheels: Tara drives around the country sharing starter cultures, along with the history and science of fermentation, and the stories she gathers on the road. Along with millions of microbes, she travels with a gray panther-like cat named Franklin. She lives in Eugene, Oregon.